Hat-trick are not a daily affair but on Friday blessed day for the bowlers, it could so turn out that one is treated with two of them. Following Samuel Badree 's exploits against Mumbai Indians, it was the turn of Andrew Tye to hog the limelight on IPL debut match. It took the table -toppers of the last edition, Gujarat Lions, three games to finally get off the mark, and when the win arrived, it did it in style. After Andrew Tye's exceptional five wicket haul, that included final- over hat-trick the home side chased a slightly challenging total in 172. Openers Brendon McCullum and Dwayne Smith put forth a blockbuster opening stand, adding 94 runs inside 9 overs of the chase to put the Lions well on course for a victory. The Lions did throw in a fight but captain Suresh Raina and Aron Finch ensured that there were no hiccups in knocking off the reminder of the target. Eventually, the Lions picked up contest by 7 wickets with 2 overs to left. Hat-trick are not a daily affair but on Friday blessed day for the bowlers, it could so turn out that one is treated with two of them. Following Samuel Badree 's exploits against Mumbai Indians, it was the turn of Andrew Tye to hog the limelight on IPL debut match. He bowled with immaculate control and his variations especially the knuckle ball with which he dismissed both Rahu Tripathi and Ben Stokes at key junctures in the game. Having lost Rahane off the 3rd ball in the innings, RPS needed a big partnership to get going and that came from Rahul Tripathi and Steve Smith's combination. While Smith Brilliant run of form was nothing but routine, Tripathi's hitting prowess, where he hit 2 Sixes and 3 Fours was real surprise. These both batsman taking game away from Gujarat Lions by scoring 64 runs in power-play overs. Andrew Tye put the knuckle ball into play in the first over of his maiden outing to arrest the momentum. With Smith gone soon after, the role of Ben Stokes as the big-hitter assumed more importance. Tye struck back with his second most important blow of the evening when his knuckle ball sent Ben Stokes back, leaving a waning MS Dhoni to do the big hitting. The Hat-trick came in the final over when dismissed Ankit Sharma, Maonoj Tiwari and Shardul Thakur in a row, this Hat-trick made a difference of 10 -20 runs. 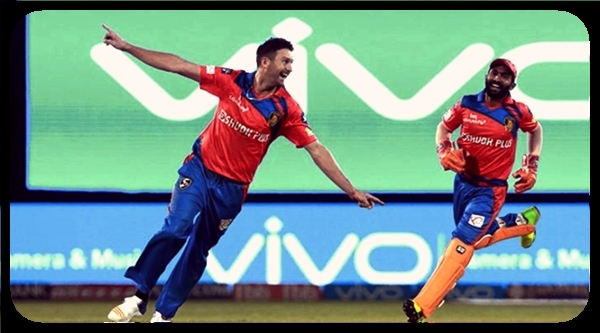 Because of Andrew Tye's Hat-trick Rising Pune stuck for 171/8 in their 20 overs. Man of the match: Andrew Tye 17/5 4overs.